X-Men movie producer Lauren Shuler Donner wanted it; Channing Tatum wanted it; the world wan... well, the world was basically okay with it. 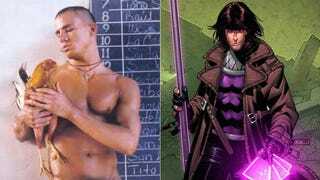 And now Donner has confirmed that Tatum will indeed play the Cajun X-Man Gambit for some kind of X-movie. The question now is whether he will appear in X-Men: Apocalypse, which will be set in the '80s, or if he'll be introduced in his own modern solo movie, which Donner has discussed wanting to make for quite some time. But what I really want to know is if Tatum can do a credible New Orleans accent. The line between a credible Cajun accent and a fake Cajun accent that makes you want to rip off your ears is razor-thin, and if Tatum's on the wrong side of that line, no amount of exploding playing cards will make the movie watchable.